Try something new with a Dinkum Shmoo Milkshake Kit and get your investment back before you sell all the milkshakes included in this pack. Blender included plus enough milkshake mix to generate over £500 in sales. Dinkum Shmoo Milkshake Machines are known for no fuss, no waste and total simplicity of use. They come as complete systems that give your customers delicious and healthy drinks. Whether it's SHMOO, the milkshake brand or CAPPUCCINO COOL, their chilled coffee flavoured mix, you will appreciate the simplicity of these machines and the great profitability that they produce. Your customers will appreciate having a healthier mouth watering drink option rather than just the everyday fizzy drinks usually on offer. The Dinkum Milkshake Maker and Shmoo shakes Mixes have proved an incredibly profitable product for our customers. Apart from the fact they make the best milkshakes we've ever tried, when you purchase this kit (which includes the milkshake blender discounted by 50%), it will return over £500 (this can be up to £700 depending on what you charge) which is between £150 - £350 profit before you even start. Healthier option to carbonated drinks - when made, Dinkum Milkshakes have less than 50% sugar compared to most fizzy drinks and squashes. They are low in calories, low in fat, gluten free and suitable for vegetarians. Also containing natural flavours and colours plus the added goodness of fresh milk. The earning potential is very rewarding selling Dinkum Milkshakes. This starter kit will pay for itself in no time. Infact, if you charge £1.40 for a 12fl oz drink, that will generate £504.00 per tub. If you charge £1.95 for the large 20fl oz drink, that will generate £503.00 per tub. You will therefore have this kit paid for by the time you have sold just two of the three milkshake mixes, and that includes the cost of the Dinkum mixer blender. Ongoing profits are very good with this product. The average unit costs including the milkshake mix, cup, straw and milk is just 37p for 12fl oz and 55p for 20fl oz. Try something new with a Dinkum Milkshake Maker! Get your investment back before you sell all the products included in this pack and enjoy the extra revenues these will generate, whilst also offering a healthy drink alternative to your customers. Making a Milkshake is simple. 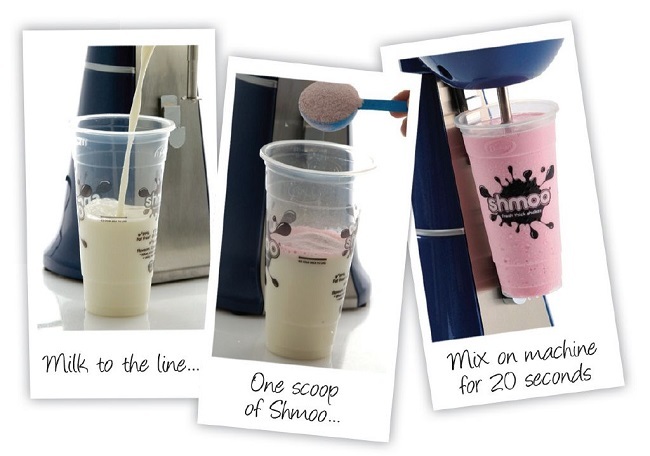 Simply fill the Shmoo branded cup with fresh cold milk up to the marked black line, add a scoop of your milkshake mix powder then place into the Dinkum blender for 20 - 30 seconds.